You probably walk the streets of your city or town, anonymous to most, just another face. 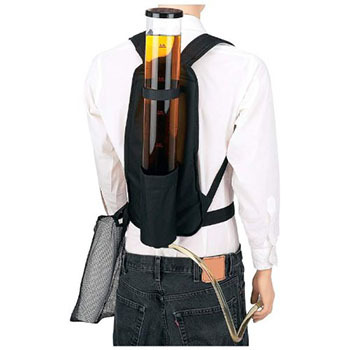 But with the “Beverage Dispenser”, aka Giant Piss Tube, you could be Piss Tube Man. Think about it. “There goes Piss Tube Man,” they’ll say. Amazing. If you don’t think carrying a big tube of piss on your back would set the townspeople adrift on a sea of boners, you could always pop for the Triple Piss Tube. Three glorious, giant cylinders of organic lemonade. Mmmmmmm.